The Journal of Philosophy of Life is an online only, open access journal started in 2011, whose aim is to “promote international dialogue on the philosophy of life” – the “philosophy of life” being an academic field they define as including the following three activities: cross-cultural, comparative, or historical research on philosophies of life, death, and nature; philosophical and ethical analysis of contemporary issues concerning human and non-human life in the age of modern technology; and philosophical analysis of the concepts surrounding life, death, and nature. 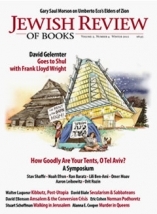 The Jewish Review of Books is a quarterly publication that publishes reviews of books, films, and other works related to Jewish religion, culture, identity, and political life. The aim of this interdisciplinary quarterly is to promote science, technology and society studies in East Asia.